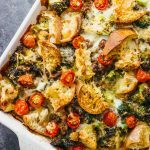 Make this delicious overnight breakfast strata with lamb — it works splendidly as an elegant brunch dish for Mother’s Day. Sautéing lamb: Heat olive oil on a large pan over medium heat. Add ground lamb, breaking it apart as it cooks. Sauté until browned and cooked through, about 10 minutes, stirring occasionally. Transfer the lamb, without the drippings, to a plate to cool. Sautéing broccoli: Using the same pan, add broccoli florets and cook until tender and browned, about 10 minutes, stirring occasionally. Transfer the broccoli to a plate to cool. Combining egg mixture: Combine and mix eggs, milk, oregano, garlic powder, salt, and pepper in a mixing bowl. Assembling: Prepare a greased 9x13 inch casserole dish. Spread about 2/3 of the bread cubes along the bottom of the dish. Top evenly with lamb, broccoli, and parmesan cheese. Spread remaining bread cubes on top, followed by tomatoes and mozzarella cheese. Pour the egg mixture on top. Wait: Cover and refrigerate for at least 1 hour and up to overnight. The last step can be done the next day. Baking: Bake at 325 F until the eggs are set and the top of the strata is browned, about 60 minutes. Let rest for 10 minutes before slicing.